On Saturday December 9th, 2017 please join us at the Art Gallery of Burlington for the Festival of Inner Lights happening between 2-4pm. The Art Gallery is on Lakeshore rd., across from Spencer’s Restaurant and Spencer Smith Park, and the Shoreline room is near the front entrance facing the lake. A dynamic and heart warming event about Yoga Connection, igniting the spark we all have inside to bring back more joy and peace into our lives. This is a family friendly event which includes a guided meditation for Mother Earth we can all participate by sitting in a chair or on the floor in you prefer. Children love to meditate with us! The word Sahaja in Sanskrit, a very ancient mother language, means “spontaneous” and “born within.” Through a simple guided meditation and just a few seconds of a method known as “thoughtless awareness,” the life force that lies dormant is awakened and can be verified scientifically by each person. The Yoga state can be achieved and felt as a cool river or cool breeze on the hands as it rises along the spine as well as the central nervous system (enlightening the nerves) like the sap that nourishes the tree of life we all have within. At this point we go from being collectively unconscious to collectively conscious human beings. We become aware of a new dimension to our lives. We get connected to the mains and a new reality enlightens our path. Sahaja Yoga offers the actualization of attaining the Yoga state, also known as moksha, nirvana, enlightenment or simply connection. The poster is an unretouched photograph of pure energy that is awakened from within through Sahaja Yoga methods. Many people who have experienced getting what is known as their “self-realization” have experienced positive, transformational life journeys that will be shared. The energy feels wonderful, no experience necessary, just come with an open heart and mind. Don’t miss the First Annual Tribal Memories Festival and Pow Wow (only $5.00) and Free Sahaja Yoga Meditation Classes http://www.free-meditation.ca/archives/22225 ( that will help you to connect to Mother Earth, your spirit or higher self, everyone and everything…all happening in Winnipeg March, 2017, the Heart of Canada! 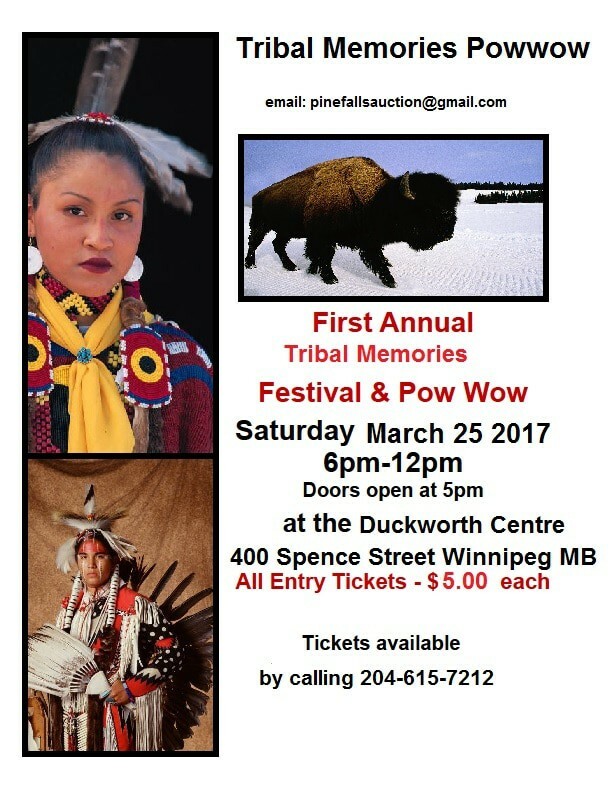 On Saturday March 25th, 2017, everyone, from everywhere is invited to the First Annual Tribal Memories Aboriginal Festival and Pow Wow at the Duckworth Centre, 400 Spence Street, at the University of Winnipeg, Winnipeg, Manitoba, Canada. The entrance fee is only $5.00 and you to get tickets you can call 204-615-7212, email pinefallsauction@gmail.com or at buy at the door, which opens at 5:00pm. The wonderful festival will start at 6:00pm and go to about 11:30 at night. I had the pleasure of meeting Dakota, Marty and Cody who were inviting everyone passing through Portage Place in Winnipeg to their wonderful, powerful event. They were very warm and brotherly, and I am extending this invitation out to this Aboriginal festival, open to the public, it is a great opportunity to enjoy our oneness and connection with everyone and Mother Earth. In addition, please join Sahaja Yoga Winnipeg for Free Meditation Classes from March 24th to March 28th, 2017 to also connect to Mother Earth through a simple, guided meditation known as “thoughtless awareness”, with no hard poses, you can sit in a chair or on the floor, and feel the connection, joy and peace. Achieving the yoga state is a great tool for students during exam pressures, relieving anxiety, emotional balance, harmony and better health. A great way to de-stress and connect to your higher self. All ages are welcome, and it is always free, in 100 countries, world-wide. I encourage everyone to drop in! http://www.free-meditation.ca/archives/22225 for links to more classes and great articles celebrating oneness and respect for each other and this planet we share. Why? -To spread Inner Peace, Re-Connect with Mother Earth, Harmony and Outer Peace through R.A.I.N. to heal M.E. movement and local initiative. -R.A.I.N. TO HEAL M.E. stands for Realize Awareness In Nations to heal Mother Earth. 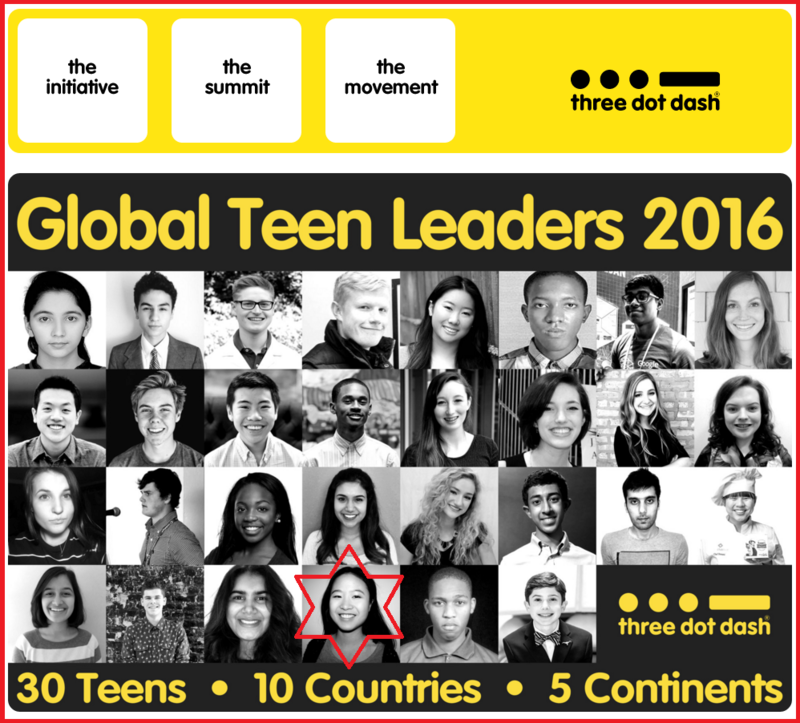 -Shulin Zhang, a local teen, and dynamic volunteer for a non-profit group, promotes inner peace in schools and is also part of R.A.I.N. to heal M.E. -May is Mental Health Awareness Month, many schools have already benefited from participating in the inner peace workshops, gaining tools to deal with stress and depression, with many appreciation letters, thank you letters and testimonials. How? 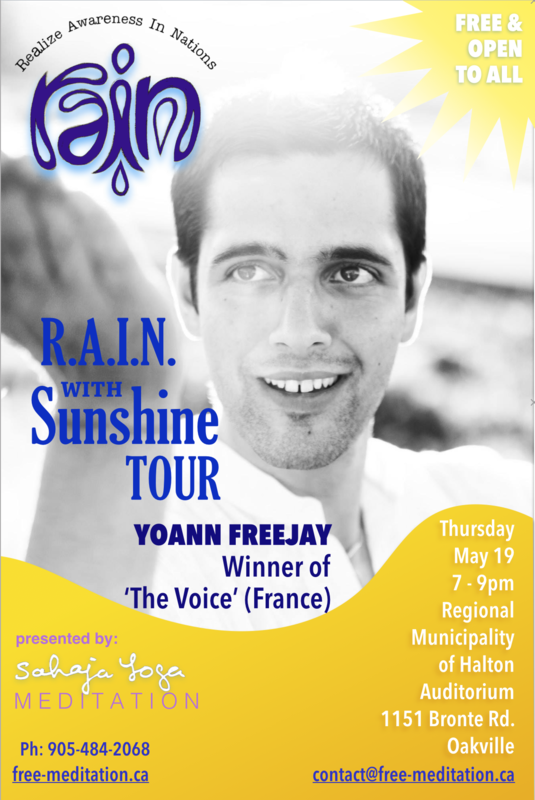 Yoann FreeJay studied Musical Therapy and his music can touch the heart and soul, and help people of all ages, especially youth. Friday May 27th, 7-9pm, North York Centre, Council Chamber 5100 Yonge st. Toronto, and many high schools to spread inner peace. Robert Galinsky introduced Shulin to a group of incarcerated youth age 18 – 23 through “literacy for incarcerated youth” To teach meditation on behalf of R.A.I.N. to heal M.E. My experience as a citizen reporter for Winnipeg’s Community News Commons has been one of mutual respect and professionalism in journalism. I want to thank Noah the editor for recognizing that Winnipeg’s population may be interested in Free meditation classes offered at local libraries. His edits are actually in tune with the material presented, and I really appreciate this opportunity to express my gratitude for having published two of my articles towards helping seekers of truth, better mental health, yoga enthusiasts, and the need for everyone on this planet to connect and heal with their higher self, each other and mother earth. Thank you for recognizing that local solutions can have global impact on neighboring brothers and sisters and change the quality of our lives, for the better. Please read below an informative article on the real meaning of the word Yoga and the impact this newly-felt inner peace is having on the community of Winnipeg. Free classes as being offered in February for the second month in a row, but this time, at the St. Boniface Library. CNC is an online news hub authored by you, your friends and neighbours, sharing stories to make our world a better place. By creating CNC, The Winnipeg Foundation believes a more informed and engaged community is a more caring and giving community, building the capacity needed for stronger, healthier neighbourhoods. “I finally feel a sense of peace,” said one woman. “I feel the life force all throughout my hands,” said another. “I look forward to it all week, I am so excited and feel this amazing connection!” one more person exclaimed. These are just a few reactions to the most recent Winnipeg Free Meditation classes held in January at Millennium Library. Beginning Feb. 8, these sessions will be held for the second consecutive month with added daytime classes at a new location – St. Boniface Library, 100-131 Provencher Blvd, on the second floor, Salle Marie-Lynn Bernard (room). Many attendees confirm enthusiastically each class builds upon that new sense of being connected to their higher self, as well as feeling a deeper sense of purpose. The casual observer can witness curious participants and deep seekers transform from class to class, and after just three sessions, are beaming. “It is both relaxing, and energizing,” one man said in describing this new-found awareness as a source of joy and peace. Between the two thoughts generated by the past and future is a space that can be widened in the present, known as “thoughtless awareness.” This inner sense of satisfaction transforms a person’s perspective and improves one’s health on every level. Sessions are great for beginners or for those seeking inner peace and tools to deal with every day stress. Classes require no special clothes or exercises or previous experience. One can sit in a chair or on the floor if they prefer. 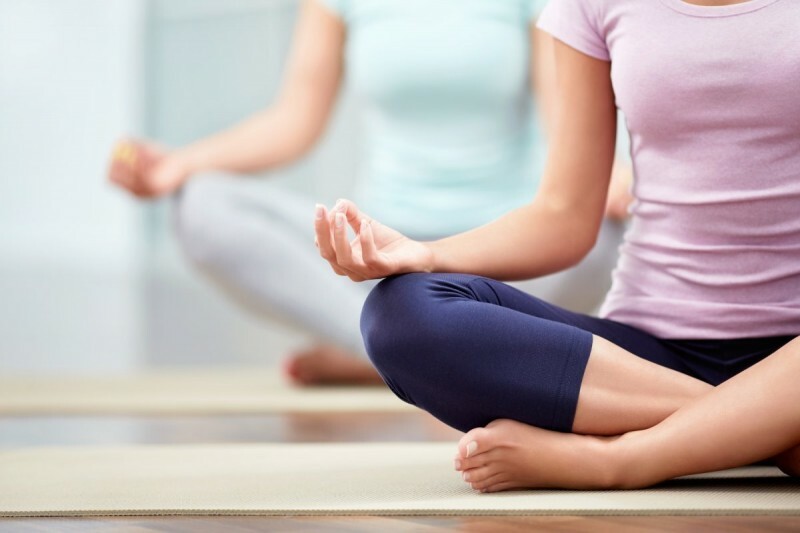 Included in the class is a guided meditation that is easy to follow – gentle chakra (energy centres within our subtle system) cleansing workshops, helping attendees gain their self-realization, the Sanskrit definition of the word Yoga, which means union or connection. Once one has achieved and established a connection with one’s higher self, a new vibratory awareness reveals very simply the state of a person’s energy centres and how someone can correct them on their own, becoming a more balanced and more joyful person. There is a belief one should not pay for this state of yoga because it is everyone’s birthright to access and to gain this new, pure knowledge of the higher self. Climbing the Himalayas is not necessary to receive enlightenment in these modern times, due to this unique discovery. This is the second year of this meditation marathon that has attracted interest of seekers of truth from all walks of life. In last month’s sessions, attendees enjoyed a guided meditation and learned about the wonderful qualities inside every human being. Several attendees felt sensations in their hands, indicating they achieved the yoga state in just one session. The questions were insightful and specific. The genuine smiles were priceless. It is clear many people recognize there is more to life than materialistic pursuits; such as, learning how to balance emotions and incorporate techniques to heal depression and anxiety. In an effort to cover more material and explore this new-found peace, a total of nine sessions are slated for February 2016 which include several daytime and evening classes. Three daytime classes will be held on Feb. 8, with two more daytime sessions to be offered free to the public on Feb. 24. Evening classes are Feb. 10 starting at 7:15 p.m., as well as on Feb. 22 with three classes starting from 5:30 p.m., one hour each. Participants are invited to join as many classes as they like, with new presentations and short clips to watch for each session. There is no limit to how many classes one can attend; in fact, people are encouraged to take advantage and stay for more than one. Drop in guests can join in anytime for even more meditation. There is always a brief review for newcomers. One is never early or late, as the invitation is to pop in anytime and slip into a chair. Attendees’ hands are kept open on their laps to enjoy this refreshing new dimension that can be felt from within, and can enhance happiness and reinforce a joy of life. Removing one’s shoes, if comfortable doing so, is a simple way to connect to Mother Earth and feel more relaxed. Many great tips have been shared so far, with more to come. Indeed, anyone can learn to use this power within to become more detached from problems and stresses, and more in tune with the joy of their spirit. It is believed a person can evolve their personality only when they are in the present, and have achieved self-realization. It is a spontaneous, living process, by which one can experiment, like a scientist, and find out what is the truth of one’s being. It can be felt as it rises along the central nervous system as a “cool river” or “cool breeze” that has been described in many traditions throughout history. A by-product of this new awakened energy inside is improved physical, mental, emotional and spiritual healing. The idea of separation is a myth, because all humans are connected to everyone and everything. Please contact sahajayogawinnipeg@gmail.com for more information, or join the Facebook page, Winnipeg Free Meditation. Paula Erskine is a Winnipeg Free Meditation Instructor and flight attendant, enjoying her crew rest teaching meditation in Winnipeg in between her flight travels down south. She received her self-realization more than eight years ago and has a pure desire to spread this joyful state to others. For those that attended the first sessions in 2016, there was some interest to have more time together and also an extra earlier session. Since the Buchwald and Anhang room of the Millenium Library are rented for 3 hours every time, this is possible! So, if anyone wants an extra session, we are adding to each class already advertised. The extra sessions will be from 6:30-7:30pm in the same rooms listed above. Anyone can drop in at any point, don’t worry about being late or early, we will review a quick intro. at the 7:30 pm mark to keep everyone informed. Also, no material will be repeated. a guided meditation will be in each session, but these can be different, as there is very much to discover about our higher selves and the power we have within ourselves! We will watch different clips, short talks, and there will be a Question Answer period. The wonderful seekers I met at the January 13th session felt calm, peace, great vibes and had very poignant questions. I really enjoyed meeting all of you. What makes my job as a flight attendant so rewarding is making my life meaningful every day even while I am away in other cities in Canada or around the world. 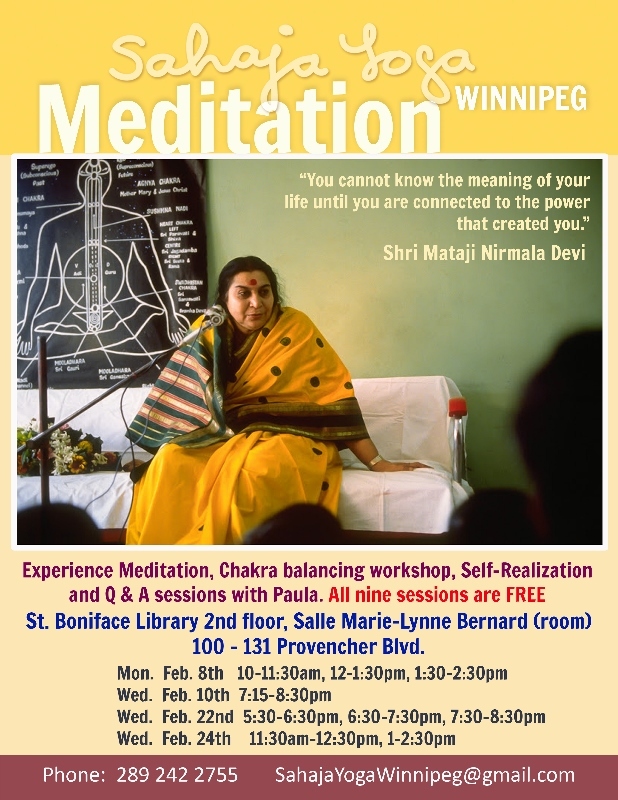 Last year, I was able to hold some Sahaja Yoga meditation sessions at St. Boniface Library and Millenium Library. I met very interesting people there who want to connect and did feel that this was very relaxing yet energizing at the same time. So, don’t worry about special clothes and poses. Self-Realization or yoga can easily be achieved by sitting in a chair, or on the floor, if you prefer. If you are comfortable, you can take off your shoes. Please join us for a session! Also, We will announce shortly, if more sessions can be added as my airline schedule gets released later today. The season in Winnipeg is generally January to March, so hopefully there will be classes all 3 months that I can share with those looking for inner peace and tools to de-stress. All ages are welcome, it is a guided meditation, so don’t worry about previous experience. 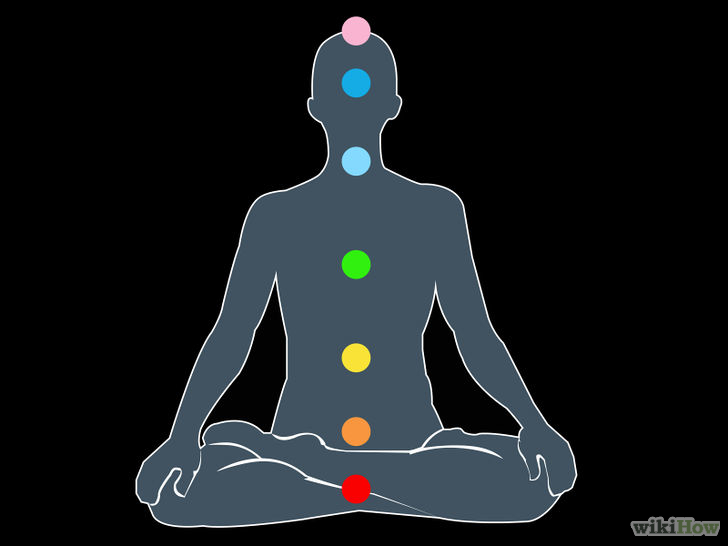 We will learn about the qualities of the chakras and enlighten them so they can empower us with qualities that help us feel the joy that comes from connection. This is achieved through the language of vibrations, which we learn to recognize and feel what we need for optimal health and satisfaction. Hope to hear from you, it would be great if you let us know you are coming! But don’t let the thought of registering keep you from dropping in. And no one has to stay the entire time. Just try, even for a short while, you will definitely get some inkling of what it is about. Come with an open heart and a desire to de-clutter the debris lurking in our constantly changing minds. The truth is, between the thoughts, while being completely aware and connected, the brain gets enlightened, and gives us access to the ultimate truths of our being. So we start “listening” through a different sense, the language of vibrations, that finally gives us a scientifically verifiable way of discovering what is true in this world and what is good for us. Also we start to enjoy this new yoga path, which keeps us in balance and helps us feel a newfound joy. Music, art, movies, people, and places can emit wonderful vibrations that we can feel along our central nervous system, once we are enlightened. It is a fascinating process, difficult to describe, so just come try it, more than once, so you can access these powers we all have to be superhuman, and happy. Namaste, everyone! Meditation Marathon in Winnipeg Feb. 18-Feb. 22, 2015 Drop in Anytime and Try it! Contact is SahajaYogaWinnipeg@gmail.com.Other Successful Sahaja Yoga meditation MARATHONS initiated by Halton Team.